Brilliant Lawns is a family lawn care business run by the Hector Family. We take pride in what we do. We offer a professional lawn treatment service, friendly advice and solutions to help create beautiful lawns. We are all fully qualified and licensed to apply lawn treatments and hold NPTC mandatory Certificates which means we know how to handle and spray chemical treatments safely. 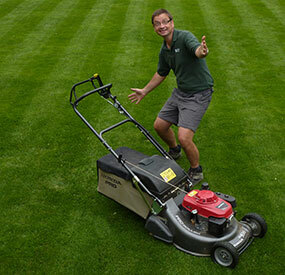 The lawn care industry is a very satisfying market to work in offering great job satisfaction. We take lawns that are past there best and help turn them into something the owners can be proud of. If you need help with mower set up and advice with cut heights just contact Tim. Remember you are dealing with a small team at Brilliant Lawns so you will be an important customer to us and won't get lost in the numbers. I have been playing croquet for over 25 years and it is croquet that caused my interest in lawns and sports turf. The game is played on courts that measure 28 yards x 35 yards - bigger than two tennis courts. The surface needs to be as flat and fast as possible, which means a lot of groundwork. For the past 20 years I have been involved in the maintenance of croquet lawns which are similar finish to bowling greens. With help from the Sports Turf Research Institute in 2005 was responsible for the creation of two new croquet lawns at Letchworth and the on-going work to bring them up to high quality standards. I am delighted to say that they are now amongst the best in the country. This has always been on a voluntary basis and I have been supported by a willing band of club members. Having gained a lot of knowledge and practical experience over the years I have written articles on the subject and also become involved in advising croquet clubs on ground maintenance. It is always rewarding to see worn out lawns transform into high quality playing surfaces.